Phone stands are so useful to have on hand! With a personalized phone stand, add a little spice to whatever room you use it in! Better yet, get one to match the decor in each room of your home! This hardboard phone stand comes in two sizes. The smaller size is approximately 4" x 3.25" x 7", while the larger is 4" x 3.77" x 8.5". The smaller size is best for an iPhone 6 or anything smaller. The larger size fits an iPhone 6 Plus or anything a little larger. Of course the smaller stand will still fit larger phones, but you want to make sure you can see as much of your beautiful design as possible! The stand is made of two pieces that fit together easily and balance against one another. The bottom part of the stand even has a space for your phone charger to fit while you are using it. You can use this stand for so many things. Use it when you're in the kitchen looking up recipes, while you're watching your favorite TV show, or when appointed DJ at a rocking party! This little stand will make life so much easier. 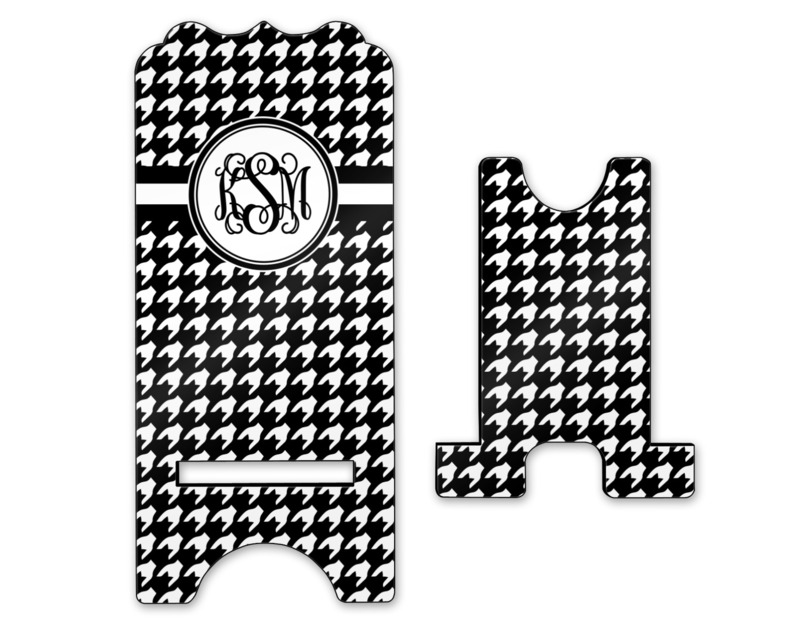 Personalize your phone stand with a crazy pattern or fun graphic! Look through our system full of design elements to put together to create the perfect design! 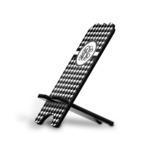 Both the front and bottom of the stand are sublimated to make a spectacular design. If you ever have any questions, get in touch with us on our online chat or by phone. If this product interests you, be sure to check out the rest of the electronics section! We have multiple other cellphone products including a ring stand and holder and a USB Car Charger. I love these They will make a great gift. I ordered them and received them in just a few days. Great quality and great service.